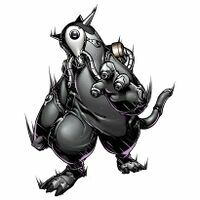 An artificial Digimon manufactured by stuffing energy stolen from other Digimon within a special rubber body. 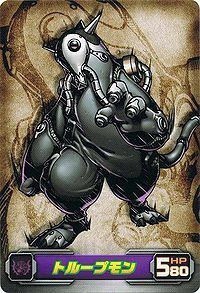 As it is a machine-like Digimon that can only perform as commanded, it is absolutely incapable of spontaneous behavior. It doesn't get fatigued, it doesn't feel pain, it doesn't fear death, and it doesn't need to sleep. It is definitely a fighting machine. 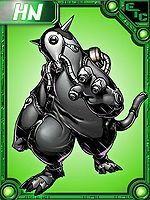 Its collective behavior is pretty basic, and its individual fighting strength is not very great, but that probably isn't able to make a dent in the extent of its confidence in its ability for human wave tactics, just due to its strength of numbers. An injured Troopmon will just exhale its energy filling, transferring it to a new special rubber body which is reborn as a new Troopmon, so it is actually sent out to the battlefield many times over. 1) n., Troops, a body of soldiers, police, etc..
2) v., To walk, march, or pass in rank or order. Troopmon make up a large portion of the Bagra Army's infantry. An army of Troopmon are first seen in Taiki's dream the morning before he enters the Digital World. 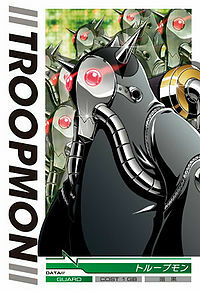 Many Troopmon are part of the Green Zone Army under the control of Mad Leomon. Two of these are absorbed by Mad Leomon, along with a number of Mammon and Chikurimon, transforming him in Armed Mad Leomon. A second group of Troopmon appears in a recently conquered, unnamed Zone under the direct control of Tactimon. One arrives to inform Tactimon that Ancient Volcamon has captured Xros Heart. Kiriha is seen terrorizing another group of Troopmon in a Zone under his control. 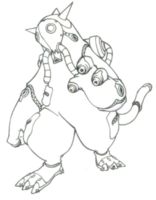 A number of Troopmon are seen as part of Ice Devimon's army in the Lake Zone. Another Troopmon reports to Lilithmon, informing her of Baalmon's failure to kill Taiki in the Sand Zone. A few Troopmon act as prison guards in the Sweets Zone, guarding the patissiers for Matadrmon. Troopmon is only obtainable as a collectible DigiCard. An artificial Digimon that stores energy stolen from other Digimon within its body, which is made of a special rubber. It obeys orders given to it with the loyalty of a machine, and attacks in great numbers without showing any signs of fatigue. This page was last modified on 28 December 2018, at 15:23.